After making Robert’s magnetic office board, I have a bunch of short pieces of bike chain all clean and shiny and waiting to be made into a project. I’ve been searching the internets and the Pinterest for ideas to use up these short bits, though I didn’t find a ton of recycled bicycle chain tutorials out there. Bracelets, yes. But bowls and picture frames? How do they stick together—are they welded? Are the pins tightened? Are they glued? Please, please weigh in if you have any ideas! Isn’t it fantastic! I saw it in Pinterest and followed links to find out more about it. It was designed by Chandi Lighting and auctioned off as part of a fundraiser for kids in Nepal. It obviously takes more than a couple measly lengths of chain, so I’ll put it on the wishlist for now. Plus, I need to figure out how to clean a ton of chain more efficiently. Just getting these seven chains clean for my last project was exhausting! I didn’t see any tutorials out there on how to make this, but it seems pretty straightforward. Make chain into circle, times three. Stack. Put votive in. Set apartment on fire. Done. I found this on Pinterest with no backlink—and 20 minutes of Google searching did me no good. I found a few other examples of this kind of pulley desk lamp, though also with no real decent context to help me figure out how to make it. But make it I will, believe you me. This is a classic—I’ve seen it all over the internets (this one is via Apartment Therapy), and in several bike shops I’ve visited. I’ll have to take a closer look next time to see how it’s put together, because in spite of its internet fame, it doesn’t look like any crafters have taken a stab at tutorializing it. I found this version on Pinterest, via Jenn Woodham. She made it herself, using chain link clips to stick it all together. Isn’t it lovely? This amazing box is from seller CitiZenoBjeCts on Etsy. It’s sold out, but they take custom orders, so you may be able to score one. There are a few bike chain clocks out there, as well, but this is my favorite! It’s from Ten Thousand Villages. Again from Uncommon Goods, we have this rad picture frame. This fun pink picture frame is from Terracycle. Have you ever worked with bicycle chains? What are your tips? You know those art cars you see around sometimes? Mostly in parades and whatnot, but sometimes just driving down the street? Well, I’ve always wanted to be the one behind the wheel. The crazier the better, really. Look at those spikes! Amazing. In high school, my dad and I talked about restoring his old International pickup together, and I had big plans to paint a mural all over it. We never got around to it, but the dream of painting a vehicle has never died. My canvas has gotten a bit smaller, however. I’ve had this Torker Interurban in my possession for several months, now, but given the rainy weather and lack of garage, all I could really do was dream. And surf the interwebs looking for inspiration. Should I paint a delicate Delft pattern, as a nod to my Dutch heritage? I love it, but I seem to be allergic to the metal because I keep getting a rash on my wrist a few days after I wear it. So why not make it into a head badge? I’ve been doing a ton of research on bike painting, and I plan to dive into the project this month. And, of course, I’ll share everything I learn with you here. Have any of you ever painted a bike? I’d love to hear any tips you might have! Oh, by the way, I’ve been collecting all my painted favorite bike inspirations on a Pinterest board. Check it out—there’s a ton of beautiful bikes out there. As the days begin to shorten and my morning commute gets darker, I’ve started to obsess about visibility. I know, I know. I could go buy one of those boxy neon yellow vests with the reflective trim—and honestly that works fine for my utilitarian, put-your-head-down-and-pedal commute through sketchy Tukwila. But it’s not exactly what I want to wear when I’m out running errands or meeting up with friends. I’ve been playing around with unique ways to add reflective touches to the clothes I like to wear (with an eye on developing a couple new items for my Etsy store), and I wanted to share some of the cool tutorials and inspirations I’ve come across. So grab some reflective ribbon and light it up! First, and absolutely most inspiring, is Tin Lizzie. She’s a cyclist and seamstress out East with an awesome flair for combining reflective shine with super chic style. Check out her awesome projects using reflective ribbon (which she lovingly refers to as “grown-up sparkles”). The “Tron” dress is incredible. A close second for creative awesomeness is Breaking Chains and Taking Lanes. She’s lead a few demos (in Edmonton, which is unfortunate for those of us not in Edmonton) on how to apply nifty graphics out of retroreflective materials repurposed from industrial manufacturing. She’s also got a good explanation of exactly what “retroreflective” means (essentially, the light bounces straight back at the source). Want to learn more about the techniques of adding some shine to your own wardrobe? Nona Varnado has a nice video of a workshop she led for an Etsy Bike Craft Night. I like her theory of placement: Use reflective tape in such a way that you’re instantly recognizable as a human on a bicycle by a car, so they can know to avoid you. 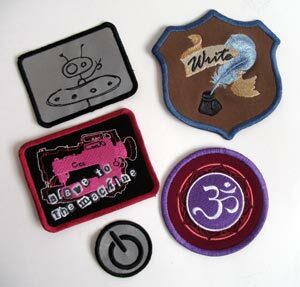 How cool are these reflective patches? Suddenly I have a desperate need for an embroidery machine. This is super cute: a DIY reflective flower to put on your handlebars. From Giver’s Log. And forget about adding reflective accents to things—what about just using the reflective materials to make accessories? Like these adorable bows from One Two Three Speed, or this flower crocheted out of reflective yarn from Two Knitting Kitties, or these reflective flower pins from Maked. Unless you live in the Northwest, you might be wondering where I’ve wandered off to lately. If you live in the Northwest, however, you probably don’t care. You haven’t checked my blog in weeks because you, like me, are outside enjoying our brief window of summer. Needless to say, I haven’t been wasting precious Vitamin D cooped up inside my sewing studio or blogging. But I was inspired by my little foray into leathercraft last week, and started nosing around the Interwebs for some project inspiration. Part of my interest stems from my desire to do a full overhaul on my Kona, to turn it from a scrappy sticker-covered bike to something with a bit more style and class. It’ll involve repainting my frame, so if anyone has any thoughts to share on that subject, I’m all ears. I have a thrifted black suede duster hanging in my closet, just waiting to be turned into bike accessories. There’s enough material there to make a few items—maybe a top tube cover, a saddlebag, a handlebar bag, grips…. Don’t worry: the transformation will be fully documented. This very cool handlebar bag was designed for a motorcycle, but I think it would work very well on a bicycle. I don’t think the suede I have on hand would have enough stiffness to make such a structured bag, but it’s excellent inspiration. 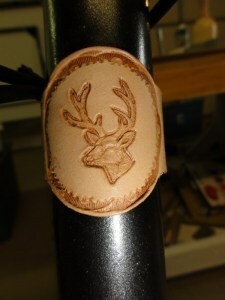 Here’s a cool personalized touch from The Velo Hobo: an engraved leather head badge. From Chic Cyclist: personalized leather mudguards will be quite nice once the weather starts to turn back toward rain and mud. Make your own leather saddle by reupholstering an old saddle with scrap leather. Be sure to scroll down the page to see other people’s examples, including a fun denim one made from a pair of old jeans. That’s all for now. Enjoy the sunshine, folks! No one likes the weather right now. In other parts of the US, people are dealing with heat waves and terrible humidity. Tornadoes are predictably chewing holes through the southeast, and the southwest is predictably on fire. It feels petty to complain about not having seen the sun since, oh, March, but here in the Northwest we’re (predictably) doing it anyway. A lot of bloggers are posting summer drink recipes and talking about sewing bathing suits and having pool parties, while I’m still wearing scarves and craving soups and hot buttered rum. So in an effort to get us inspired for the summer that we all fervently hope will actually come this year, I present to you a collection of bike picnic DIY inspiration. Sure, you can always throw a sandwich in your backpack, hop on your bike and head out to a park. But you know you want to do it with flair. From Design*Sponge, here’s a really nifty liner for a bike basket that both organized your picnic necessities and also converts into a drawstring bag for easy cleanup. Also, the technique used for dying the fabric looks fun. I’ll definitely be trying something like that. This tutorial for an Easter [bike picnic] basket is over-the-top cute with its lace and frills and bows, but I love the idea of individual roll-up caddies for all your picnicking essentials. They can be used as a placemat, too. And you don’t have to make them so frilly if you don’t want to, I promise I won’t force you. As nice as a front basket picnic is, I really dream of a larger self-contained picnic set that can attach to my rear rack. I love this idea of converting a suitcase into a picnic set, and I wonder how hard it would be to then attach pannier hooks? Thoughts? While you’re converting your suitcase, why not trick it out with retractable legs and a speaker system? I personally don’t think I could handle my table playing music at me while I’m supposed to be enjoying nature, but I love the idea of retractable legs. This is going on the Jessie DIY ToDo list, for sure. Now, to hunt down a suitcase…. Looking for more inspiration? Or just not feeling DIY? There’s always this, found at Pushbike Honey. Or this pannier from Cooking.com. So grab your bike, a blanket, some food and a buddy, and cross your fingers for sun! What are your favorite places to picnic by bike?